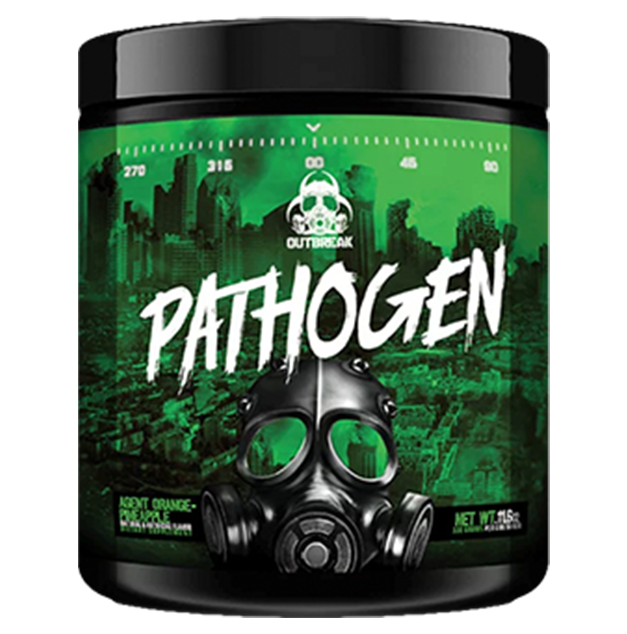 Outbreak Nutrition’s Pathogen will be the brands solid pre-workout designed for those who want more from their workouts; more gains and more results. Let’s see what’s exactly in this pre-workout and how it compares to others on the market. Each 330 gram tub of Pathogen will contain 28 servings. Other ingredients are for mixing and flavouring purposes. Outbreak Pathogen is an energy boosting pre-workout formulated to get you pumped, improve muscular endurance and increase mental focus. Some of the main benefits of Outbreak Pathogen pre-workout which makes it highly potent is in relation to the ingredients used. The formula contains 6 grams of pure citrulline malate for ultimate pumps. Citrulline malate raises nitric oxide levels to enhance blood flow to the muscles making them feel and look fuller. The product also uses nootropics like julgan regia root, a natural form of DMHA and neurotransmitter enhancer choline bitartrate to help with focus. Another key benefit of using Pathogen include the energy surge it provides. Each serving provides 350mg of caffeine which is a decent amount of caffeine in a pre-workout. Together with theacrine and theobromine, users will be quick to feel the energy and focus helping to drive workout intensity and motivation to train. Additionally, Pathogen includes a healthy dose of 3.2 grams of beta-alanine to assist with endurance and reduce muscle fatigue. Pathogen only requires a single dose for effects to kick in allowing trainers to push through each workout set. After reviewing the formula, most ingredients have been dosed properly and at optimum doses. The only downside to this product is that Pathogen is a high-stimulant formula, this pre-workout may not be suitable for those who cannot tolerate stimulants. Aside from that, Outbreak have dedicated their energy in creating a solid product, rivalling some of the best in the category. Outbreak Pathogen is available in three different flavours consisting of Agent OrangePineapple, Double Barrel Berry and War-Torn Melon. The name for each flavour has been really thought out and each flavour tastes fruity without an obvious after taste or acidity. The product also mixes well without any excess residue. Overall, Outbreak’s Pathogen pre-workout contains a solid formula that delivers extreme pumps, energy, focus and muscular endurance. With highly potent ingredients, Pathogen does more than just push the boundaries of what a pre-workout can be. If its long-lasting energy and focus you’re after Outbreak Pathogen certainly does a great job. Outbreak Pathogen is best utilised for those who love a good pump, strong energy and wanting to increase performance in the gym.